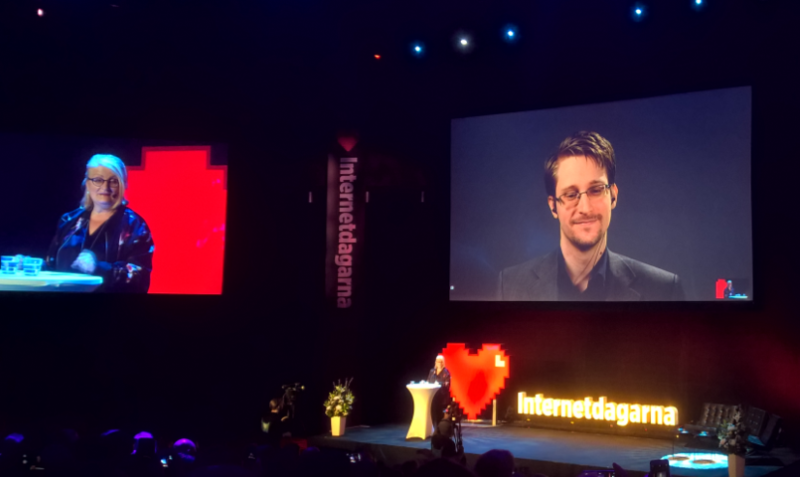 Earlier this week, Edward Snowden spoke to an enthusiastic audience at Stockholm’s Internet Days conference. Snowden, who appeared via video link, talked less about his own situation and more about what each of us can do to counter mass surveillance and help privacy and freedom of speech. His message was that there is hope. This was Edward Snowden’s reply to the moderator Brit Stakston’s question of what he thought would the recent US presidential election result means for his own fate. Like a line from a punk rock song, the exiled whistle-blower said he doesn’t care about his future. The president elect plans to appoint a CIA director that uses Snowden as a specific example of dissidents who should be put to death. This was not the only example of an almost Christ-like selflessness during this appearance. Snowden said his main contributions was in the past, now he “tries to help where he can”. – Privacy is not about something to hide, continued Edward Snowden. It’s about something to protect. The opposite of privacy is not security: the absence of privacy is not the presence of security and the presence of security is not the absence of privacy. Rather the absence of privacy is the presence of censorship. When you don’t have privacy, when you can’t speak ideas without the judgement of others, you don’t share those ideas. You’re a little bit more quiet, you’re a little less free. Privacy is the right to the self. – Privacy is the foundation of all other rights. Freedom of speech doesn’t have much meaning if you can only say what’s popular, without experiencing some retaliation. Another point Snowden touched upon several times, was the value of different perspectives for better decisions. A main reason why the security agencies ended up breaking the law and violating the privacy of many individuals, was that those decisions were made behind closed doors by a small group of similar-minded people. The same logic, Snowden applied to his own actions when he leaked the documents revealing these operations to the media. He did not post them online, he gave them to journalists. One of the reasons was that Edward Snowden wanted the judgement of others before they were made public. He also demanded that the editors gave the government a chance to make their case before anything was published, for example to make sure individuals in dangerous positions were not harmed by the dissemination of the information. Is perfect encryption enough to protect fundamental rights online? – Encryption has lots of merits, but we should not accept this as the way things should be. We must campaign to change policies and laws so people can talk to each other without risking their lives in prison. Encryption is not the long-term answer to privacy online. Protection of fundamental rights is. Edward Snowden, understandably, is sceptic of government institutions. At the same time, it is through such institutions and legislation that our rights can be defended. The law should restrict surveillance, government as well as private, and public institutions should protect our rights. There can be a positive role for government to play, after all.